Jones Bros have over 40 years’ experience in providing flat roofing services in Chichester and along the South coast, for commercial premises, and as such are well placed to offer experienced advice on all types of business and commercial roofing requirements. Thermoplastic roofing systems are among the fastest growing commercial roofing systems, made from durable materials with low temperature flexibility and high temperature tolerances, these roofs should give 20 years plus lifespan. Resistant yo chemical and ozone exposure. Reistant to Fire and wind. EPDM roofing is a rubber based product offering superior durability and versatility, making it one of the longest lasting types of commercial roofs available. 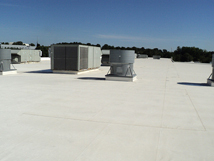 EPDM commercial roofing systems are also typically easier to install, maintain and repair than most other types of commercial roofs. 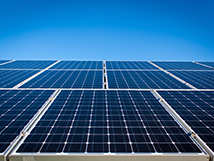 Photovoltaic Panels are becoming more popular as energy costs rise and clients strive towards green and sustainable energy, many building owners are turning to solar energy roofing systems. The Photovoltaic Panels can be installed over a rooftop or used with glass, membrane and roof-mounted tiles, to absorb sunlight and convert it to energy that can be used to produce power. Compatible with glass or tiled roofs. Green roofing has seen the largest increase in popularity of all types of roofing in recent years. 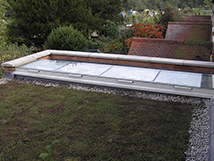 Sedum green roofs are flat roofs that are completely covered with soil and vegetation and planted over a waterproofing membrane. Green roofing systems can reduce urban heat by soaking up heat and improve a roof's insulation value and can lengthen the lifespan of the roof by as much as two to three times. It is the policy of Jones Bros (Flat Roofing) Ltd to ensure the health and safety of all employees and all personnel working in the near vicinity of any roof work being carried out, to achieve this the company employ an external health and safety advisor who carried out an internal/external health and safety audit of all procedures carried out within our company. Our Insurance Company also carry out an internal and external health and safety audit on an annual basis, continuous health and safety training is given throughout the year by training sessions and tool box talks. All staff are regularly given H.S.E. leaflets on the latest requirements and law concerning health and safety. The company have an excellent record for health and safety over the course of many years of trading. As a company, health and safety is an absolute priority to ensure the safety of all operatives, to this end all our operatives have been trained to NVQ Level 2 and hold CSCS cards. The company employ a specialist health and safety adviser to oversee all aspects of company health and safety, this specialist carries out annual training of all company operatives in various aspects of health and safety. As a company we have an excellent record for safety which is due to the care taken by our workforce. The company believe that health and safety encompasses a very wide range of activities from manual handling, ladder work, scaffold use and safety, care with LPG and gas guns, full personal safety protection, duty of care for others on work site, duty of care for equipment and property. The company has a continual policy of training to ensure the health and safety of the entire workforce; this is achieved by full in house training sessions, tool box talks, health and safety leaflets and newsletters. Jones Brothers (Flat Roofing) Ltd.